I recently found a free tool, called “Readability“, that is a Web browser bookmarklet. It strips all distractions from Web pages, and attempts to show only the primary text content. Before a user adds it to the Web browser’s toolbar, it can be set to show text in one of four styles, a font size can be chosen, and the width of left- and right margins can be selected. 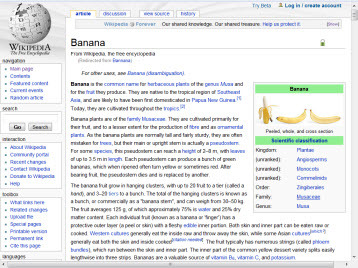 A Wikipedia page about bananas, an image of which is below, has columns of links, images, tables and other non-text elements. Clicking the Readability bookmarklet strips all elements from the page except for its central text. 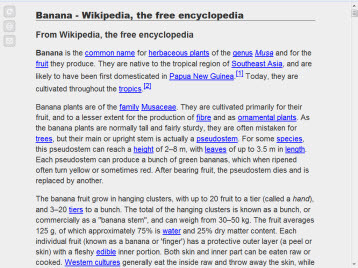 The image below shows the same page, but it displays only the main, single column of text. That is a great result. Unfortunately, on numerous other sites I tried, all those of online newspapers, the results were poor. Either Readability could not determine which was the main text content, or it displayed only a snippet of it. Readability has promise, however, as is demonstrated with the example above. Readability’s utility gives me an idea for the future Clear Helper Web site. Perhaps I can enable users to switch between two interfaces: one with main content only, and one with extra elements. More on this will be the subject of a future blog post. Note: A description and a video-demonstration of Readability can be found on the Arc90 Lab Experiment Web site. This entry was posted on 2009/12/18 at 8:06 PM and is filed under Assistive Technology, Readability, Web Usability. You can follow any responses to this entry through the RSS 2.0 feed. Both comments and pings are currently closed.